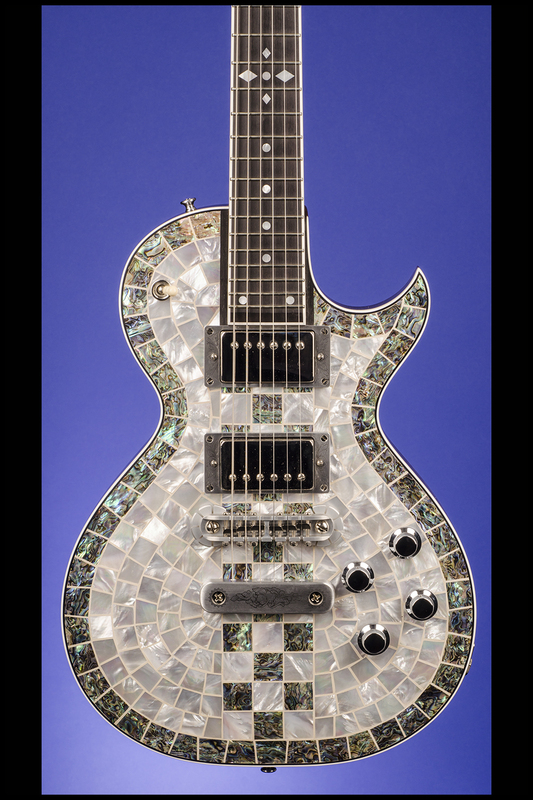 Custom Shop 24 Pearl Front Ring Chess Guitars | Fretted Americana Inc.
2016 Zemaitis Custom Shop 24 Pearl Front Ring Chess. 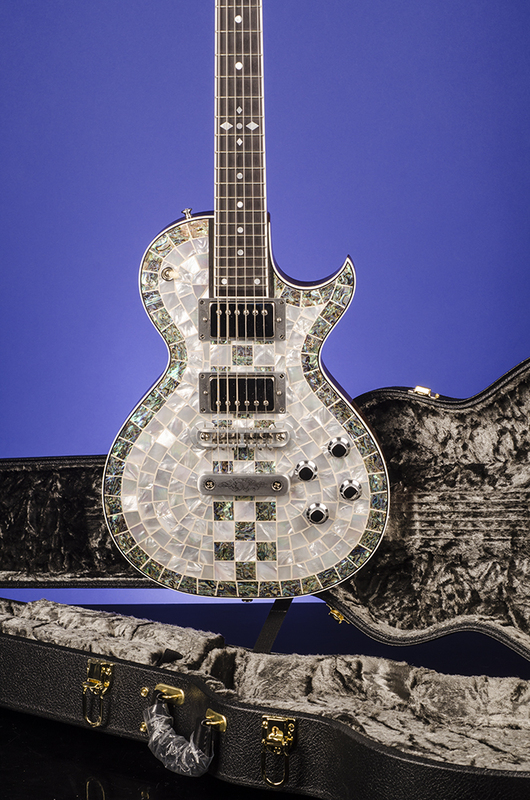 This specially hand-made, Zemaitis Custom Shop guitar weighs just 8.50 lbs. 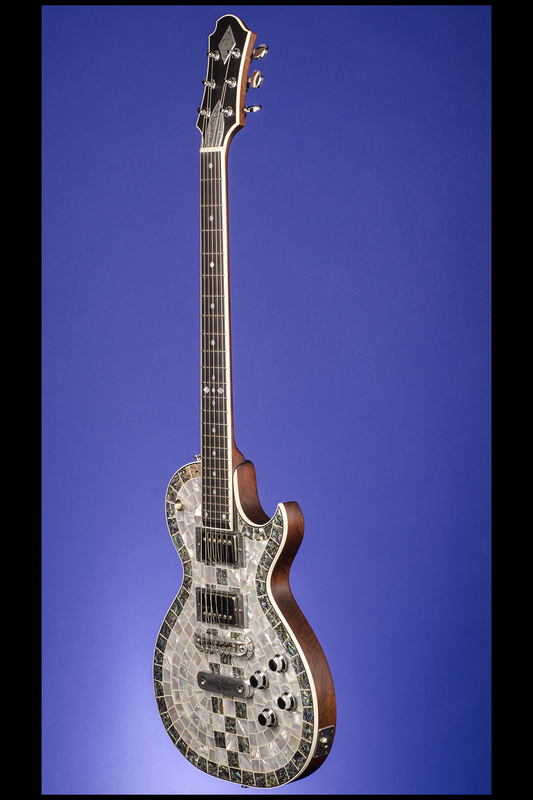 and has a 12 3/8 inch wide and just over 1 5/8 inch thick, select 'dry-aged' African mahogany body with an extremely thin coat of nitrocellulose lacquer. 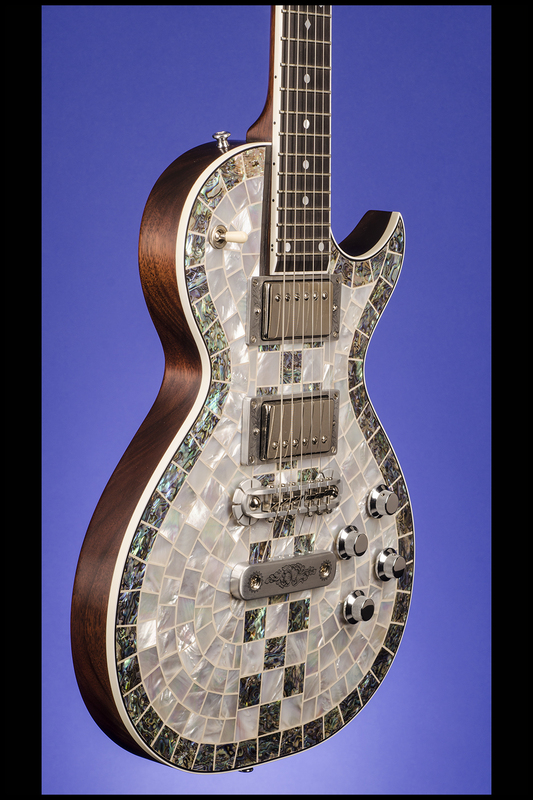 The double-bound top of this stunning guitar is hand-set in a checkerboard design with over seventy individually hand-cut pieces of abalone and over one hundred and fifty individually hand-cut pieces of pearl. 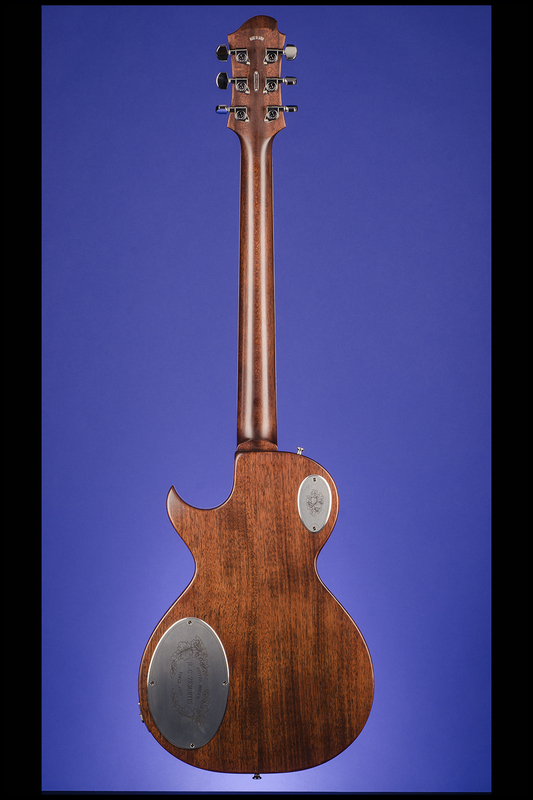 One-piece select 'dry-aged' African mahogany (set) neck with a nut width of 1 11/16 inches, a double-octave scale length of 25 inches, and a medium to fat "C" profile typical of a '59 Les Paul. 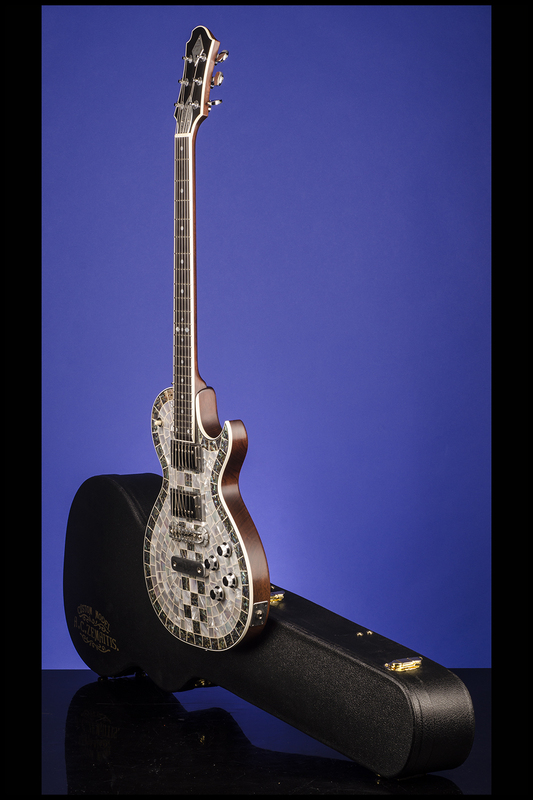 Single white-bound ebony fretboard with 24 medium frets, Zemaitis inlaid pearl dots and diamonds, and black dot side-markers. 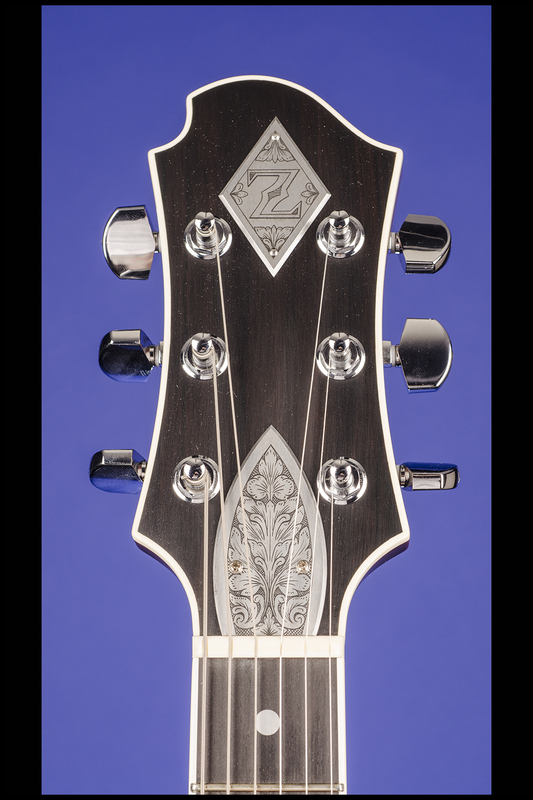 Specific asymmetrical-shaped headstock with diamond-shaped "Z" engraved metal plate secured by two pins, and dome-shaped floral-engraved metal truss-rod cover secured by two screws. 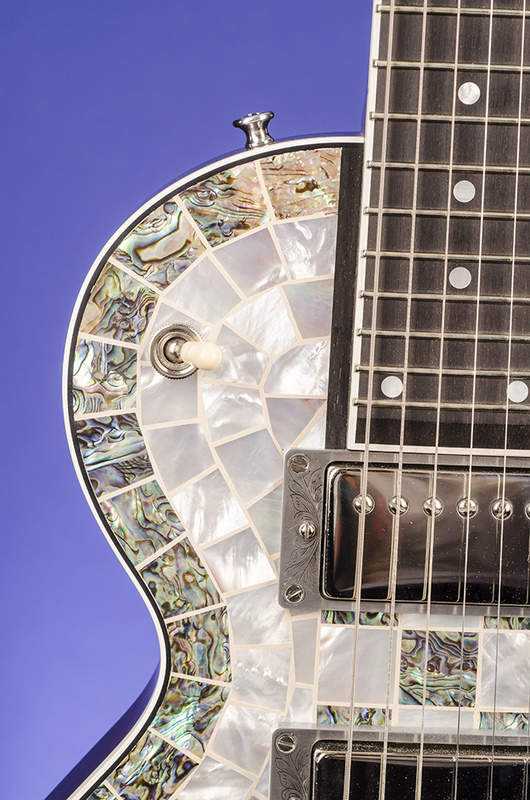 Individual Schaller M6 tuners with kidney-shaped, chrome-plated, metal buttons. 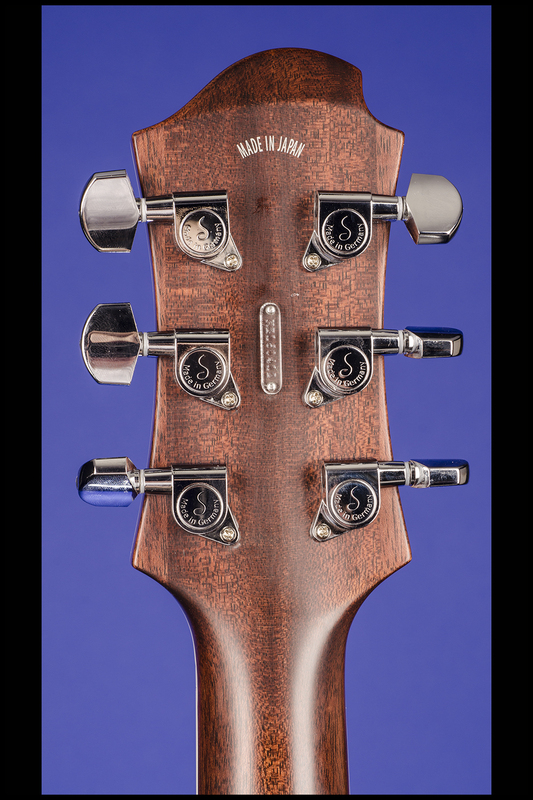 Small clear plastic plate on back of headstock, engraved with serial number "KZ160412" and secured by two pins. Two Custom voiced DiMarzio DP 103 PAF pickups with outputs of 7.61k and 7.73k. 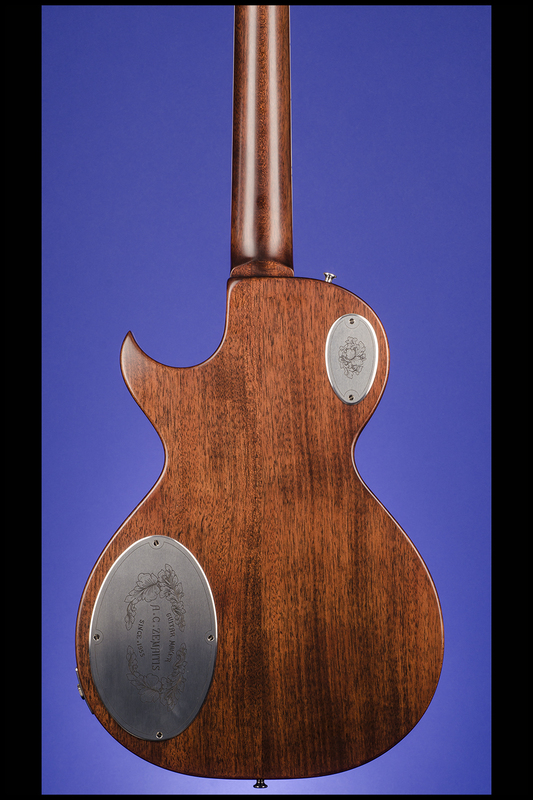 Each pickup with a 'Duralumin' floral-engraved surround secured by four screws. Four controls (two volume, two tone) on the lower treble bout plus three-way pickup selector switch on the upper bass bout. Skirt-shaped, chrome-plated control knobs with ribbed sides. 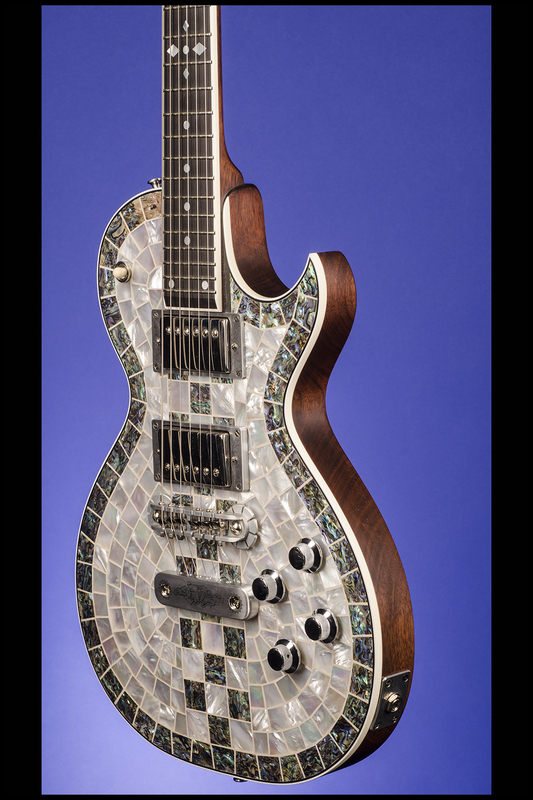 Zemaitis 'Duralumin' six-saddle bridge with individually adjustable metal saddles and floral-engraved fixed tailpiece secured by two screws. Side-mounted floral-engraved jack plate secured by our screws. 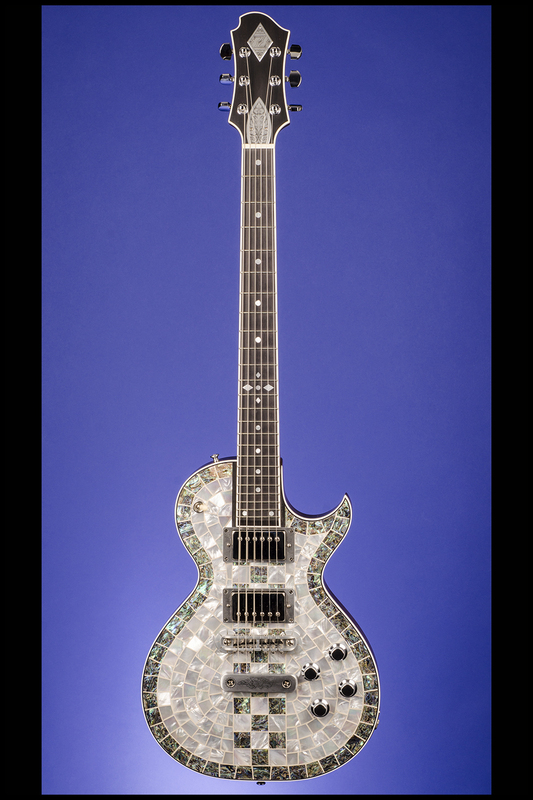 All of the electronics are constructed with American CTS and Switchcraft components as well as the Custom voiced DiMarzio DP 103 pickups and the wiring circuit is of Tony Zemaitis' original design. 'Duralumin' engraved control-cavity cover secured by four screws and 'Duralumin' engraved switch cavity cover secured by two screws. This guitar is new and in mint (9.50) condition. 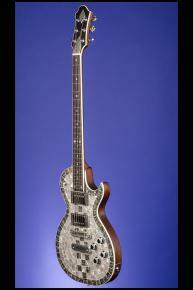 Housed in the original Zemaitis 'Custom Model' five-latch, black shaped hardshell case with gray plush lining (9.50). 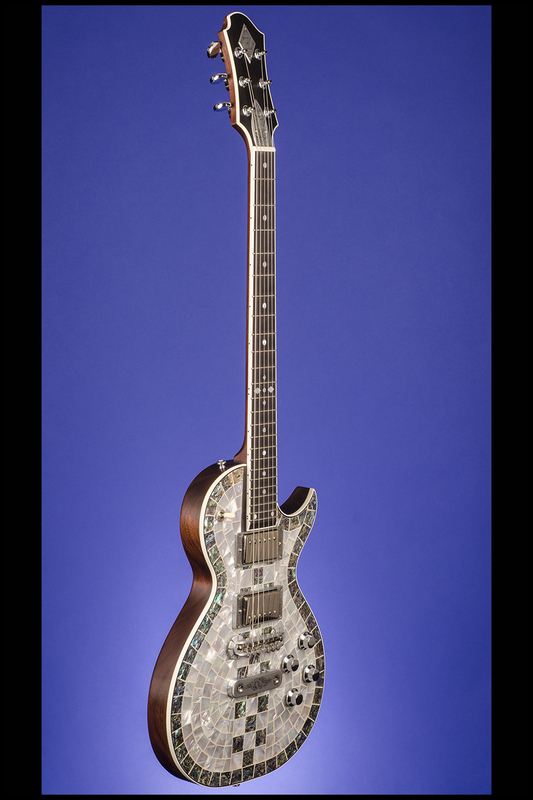 Complete with the original Product Certificate with matching serial number, dated "5/30/16", truss-rod adjustment tool and case key.